My maternal grandparents were from Poland and Galicia. They came to the United States in the 1920s. Met and married when Grandma was 19, Grandpa was 29. At home they spoke to each other only in Yiddish, although both learned to speak excellent English. And Grandma was a ferocious reader in several languages. When I stayed with them, they spoke Yiddish to me as well. As a young child I could respond and easily speak to them. But that ended when my parents realized that my siblings and I spoke and understood Yiddish. They had been using it as a secret language to discuss finances and personal matters. So the order went out…stop speaking Yiddish to the children. My Mother, in later years, would tell me that she regretted making that demand. But Yiddish connected me to my grandparents. And I studied German in high school and Hebrew in college. Then I spent a year in Israel at Hebrew University. While there I spent so much time with my great uncle and great aunts, who spoke Yiddish at home. So my Yiddish slowly improved, and I became more fluent. The kneeling sailor is speaking to my Mom;behind her my Uncle; behind him my Grandma. My Grandma’s family was lucky. She went to Europe in 1931 with my Mom and Uncle and stayed for six months. When she returned to the US in 1932, she told my grandfather that they had to get everyone out. And she started the process. She was able to get visas for her father and sister. They made my great aunt younger than her real age, so she could come in on her father’s passport. Her brothers and their wives were not as fortunate. But they did survive the war. 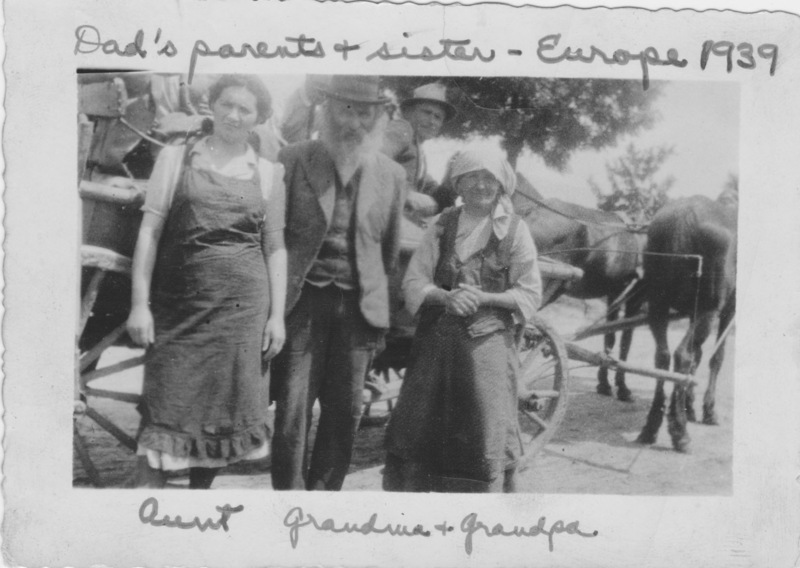 My great aunt Tova, my great Grandparents Gimple and Chava. The man driving is an Uncle. And the horses and cart they bought with the money my grandparents sent. They all perished. My Grandpa’s family was not fortunate at all. They all perished. My grandparents did send his parents money and visa to come to the US. But they could not believe what would happen. They took the money and bought a horse and cart. 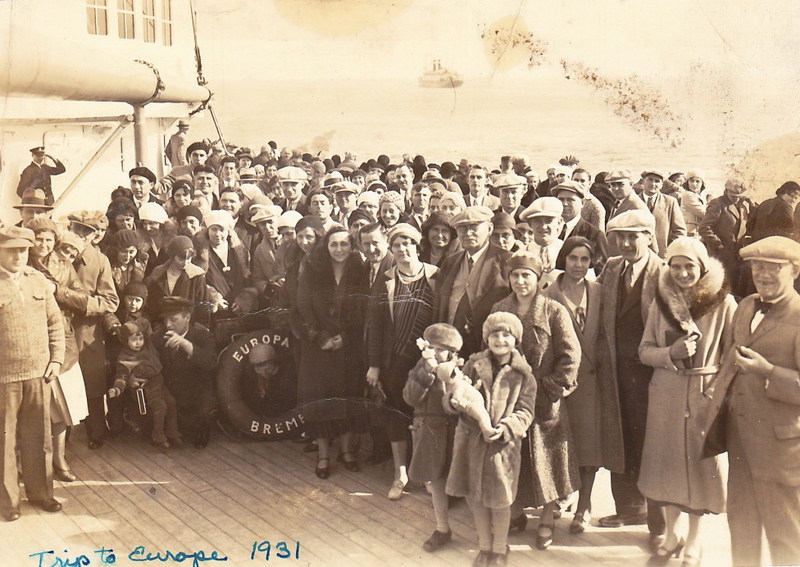 They did not want to leave their other children and grandchildren. And my grandparents could not get everyone visas. My mother used to tell me that every morning after work, when he found out that his entire family was murdered, my grandfather would sit in the kitchen and cry. He was a baker…up all night. But before he went to sleep for the day, he cried for all he lost. In the meantime, my grandparents thrived in the US. They had two children, five grandchildren; two businesses, both a bakery in New Jersey and a bungalow colony in the Catskills. Grandma wrote to her brother in Israel often. When I went as a college sophomore, I spent a year of college at Hebrew University. I had a cousin who was my age, and my great uncle and aunts (one uncle had died in the 1950s.) I met a few other relatives who had survived the Shoah. But no one ever spoke to me about it. I was young. But my Hebrew and Yiddish were improving rapidly. Then when I was a junior in college, I took my Grandma to Israel with me during winter break. She had not seen her brother in 42 years. We spent a month together. A month I will never, ever forget. The phone calls at the hotel would be in Hebrew. Someone would call and speak to me. “I understand the Tova S. is here,” they would say. “Yes,” I would respond. They would then ask genealogy. Who were her parents? Where did she live? When all the right answers were given, I would hear. Yes. She is my mother’s or father’s or someone’s cousin. And they would set up an appointment to meet with us: to see my Grandma. And the holocaust became real to me. Each person in Yiddish told my Grandma their story of how they survived the Shoah. And who had died during that horrible time. If I did not understand a word, Grandma would translate. Sometimes they would tell me the word in Hebrew. Day after day, week after week, I heard so many stories. But then came the worst of all. Rafael came. I knew him and his wife and daughter. His mother and my great grandfather were siblings. Rafael and his wife had never spoken to me about their experiences. But when Rafael saw my Grandma, it was an outburst of pain and crying from both of them. Rafael was my Grandma’s first cousin. His sister, Tova Malcha, had been my Grandma’s best friend. And Tova Malcha had not survived. When Rafael and Grandma met their memories overflowed. Not only on death, but on the lives they had left behind. At that moment, at that time, my Yiddish was at its best. I understood all. After Rafael left, I asked Grandma why no one had ever told me these stories? Why I had not met all these people who kept showing up? Why Uncle had only introduced me to a few of the relatives when I spent my year there? When we returned to the US, my Grandpa was so happy to see Grandma. “Never leave me again,” he said. He did not come with us, because he refused to ever leave the United States. She never left him again, till she died. And I never speak Yiddish or hear Yiddish without the images and sounds of that month in Israel and the Shoah ever present in my mind. Thank you for referring me back to this older post. It is so moving and so heartbreaking. Uch. Your poor grandfather. I can understand why he’d never want to leave the US. I am in tears just imagining the meeting with Rafael and your grandmother. I write about this trip in bits and pieces. It was so emotional. I have never spoken or written about my grandmother seeing her brother for the first time. The revival of Yiddish and even Ladino is amazing. A new generation is speaking it again.